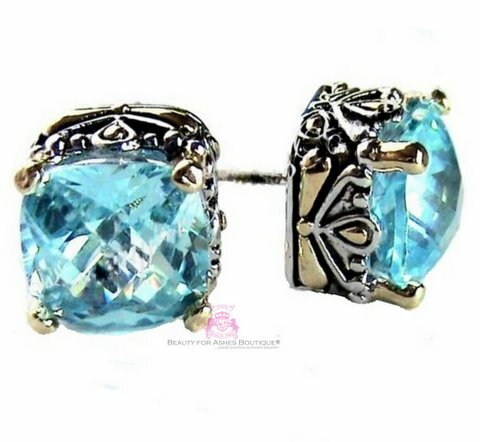 Beautiful Aqua Blue Topaz CZ with brilliant sparkle set in this detailed two tone finish Throne Room earrings. The cushion cut, or faceted checker cut as some call it, allows this gem to sparkle from every angle. These earrings have 3mls of rhodium (white gold) and yellow gold electroplating for super long lasting wear. The stone measures about 10mm x 10mm in diameter. 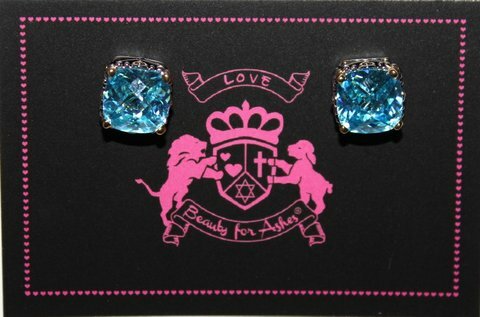 Amazing Aqua Blue Topaz Cubic Zirconia Earrings are post style in the CENTER which do not droop! VERY FLATTERING!